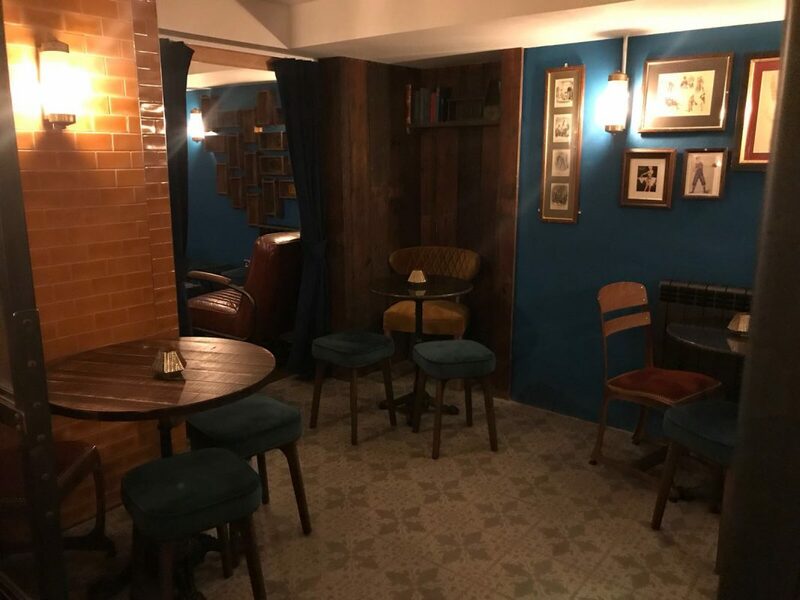 Tucked away in a side street between Goodge Street and Tottenham Court road tube stations lies a cute pub in Fitzrovia. 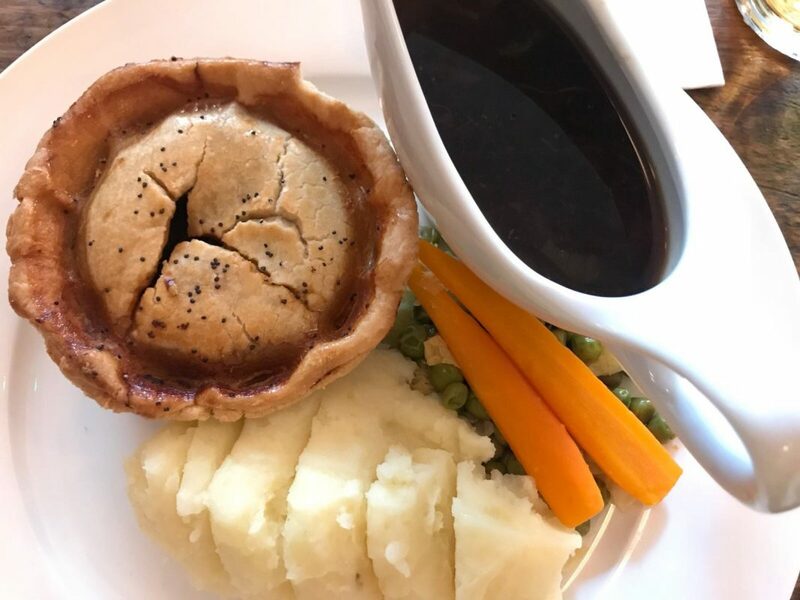 With a cosy and attractive interior, extremely friendly staff, a hearty food menu and great music, the Newman Arms was a great choice! 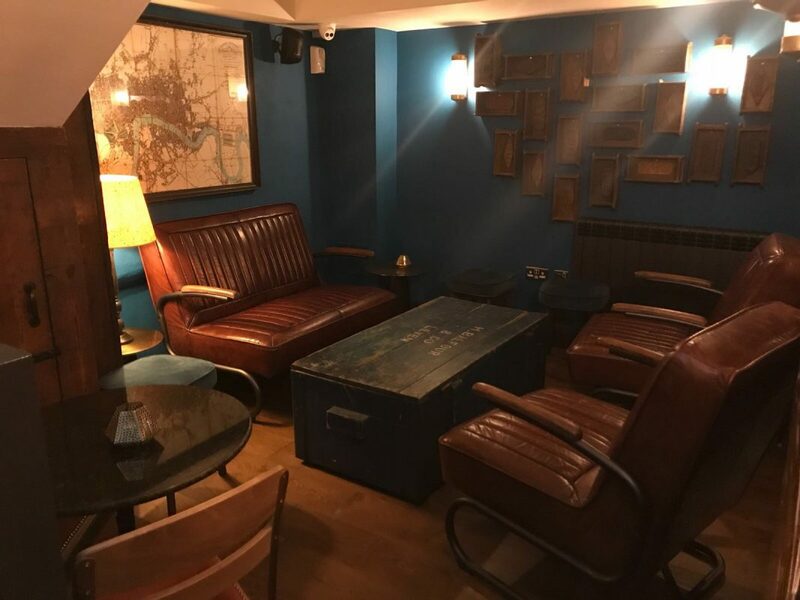 Don’t be fooled by the tiny bar area when you first walk in either – it has a great atmosphere and the bar staff will make you feel really welcome. Not only that, they have an upstairs drinking and dining area and a downstairs snug area. 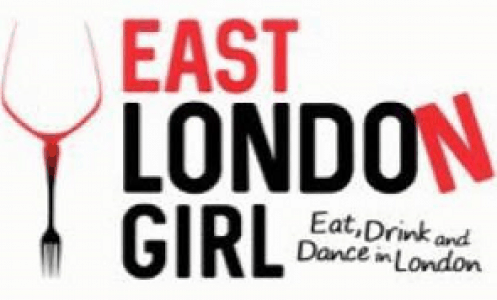 If you are looking for a pub to sit down and have a beer in then you can definitely do it here! The food menu is exactly what you would want from a cosy pub like this. With hearty pies and bagels and scrumptious snacks it is a simple menu with down to earth prices. You will pay no more than £11 for a pie and no more than £9 for a bagel. 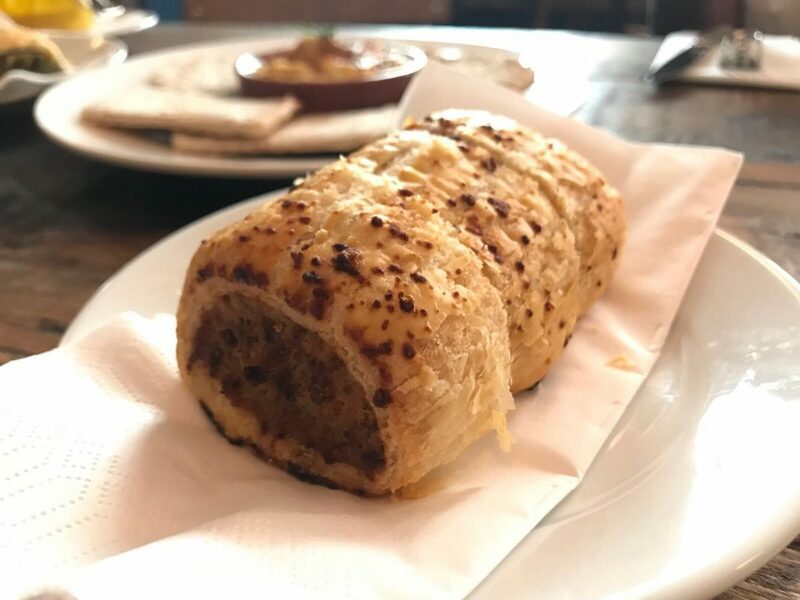 We started with the Hummus with Harissa and Pitta (£4) and two different sausage rolls (£3.50).For such affordable prices these portion sizes were very generous. 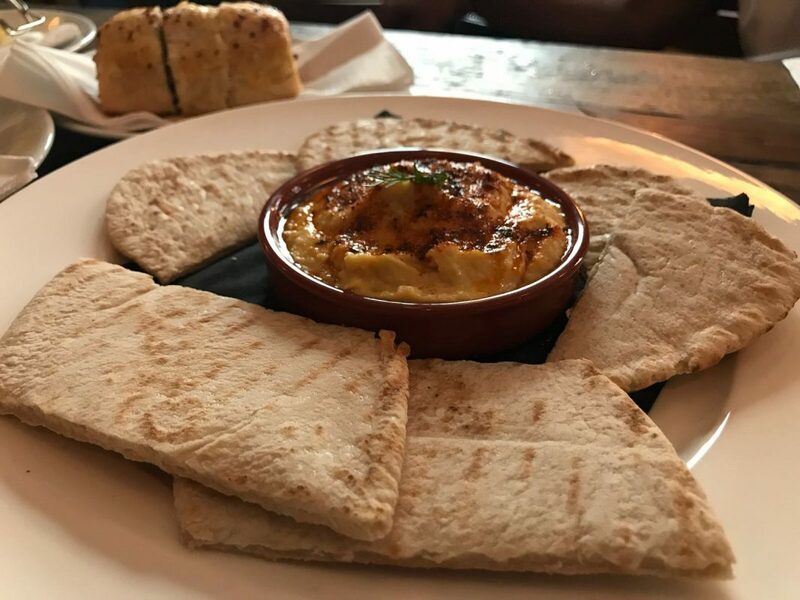 The hummus and pitta and sausage rolls could easily be shared but they are so good you may want them for herself! 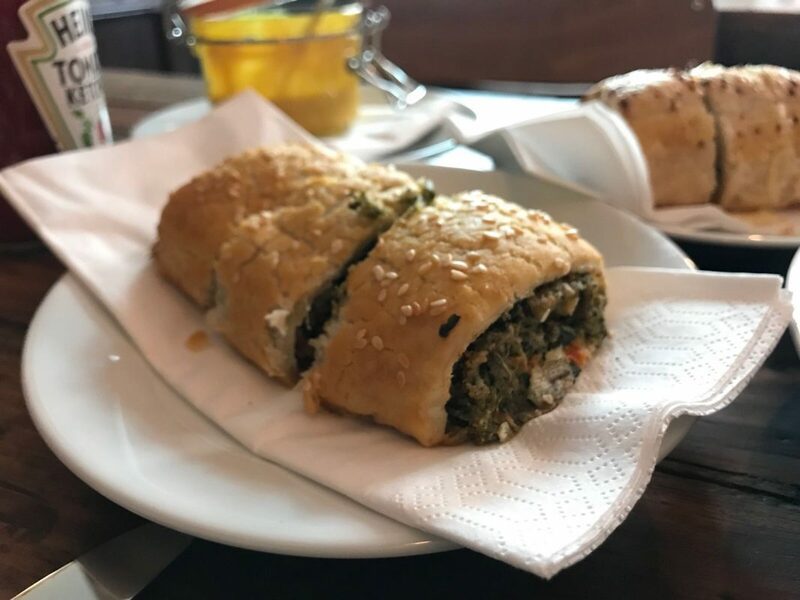 We loved the Sausage with caramelised onions and Ricotta and Spinach sausage roll which was so tasty! We were lucky enough to get a taster of the bagels too which were so delicious. 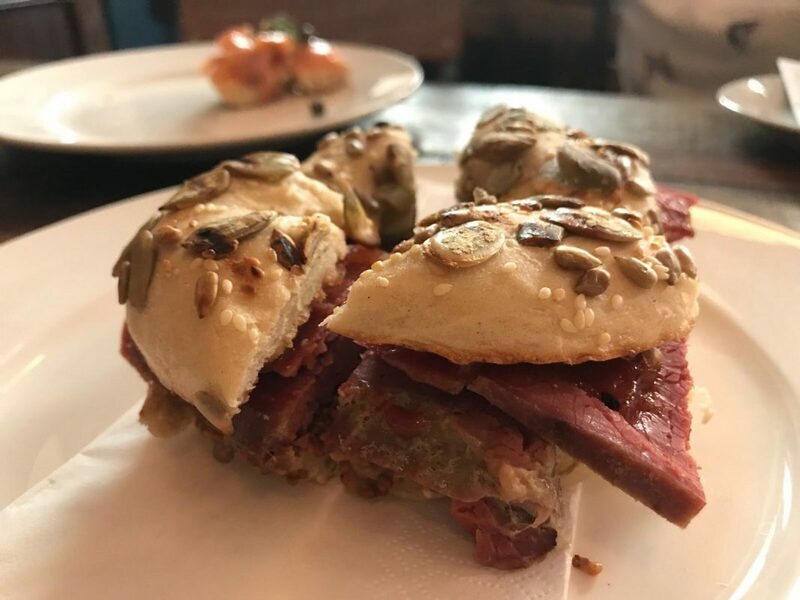 You get two different options – the Smoked Salmon or the Salt Beef. The salmon was my clear favourite but the flavour of the salt beef was incredible! 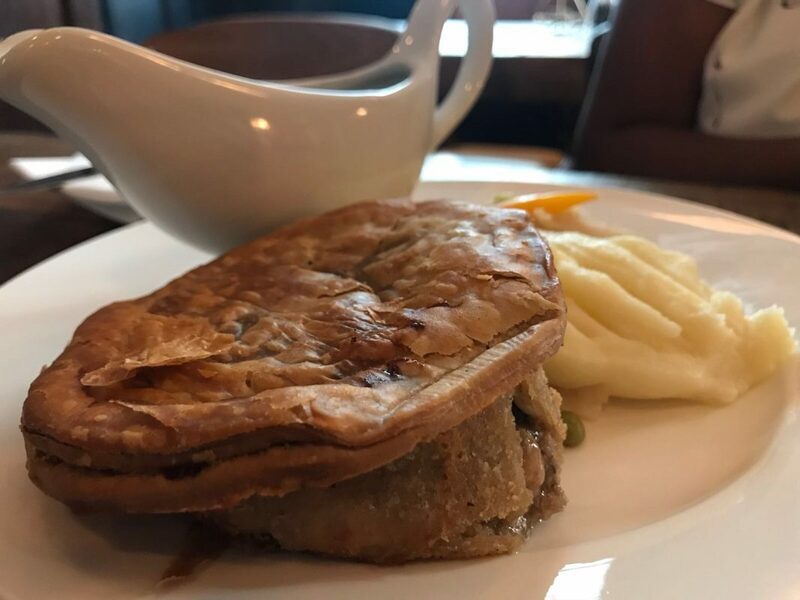 We sampled all three pies from the menu – the Chicken and Leek, Steak and Truman’s Runner Ale, and the Peppered, Mushroom and Stilton Pie. All come served with a decent helping of fluffy mash potato, vegetables and gravy! The pies were absolutely delicious and incredibly fresh and flavoursome given they are prepared on site by the chef. We loved them all but the steak was our favourite. 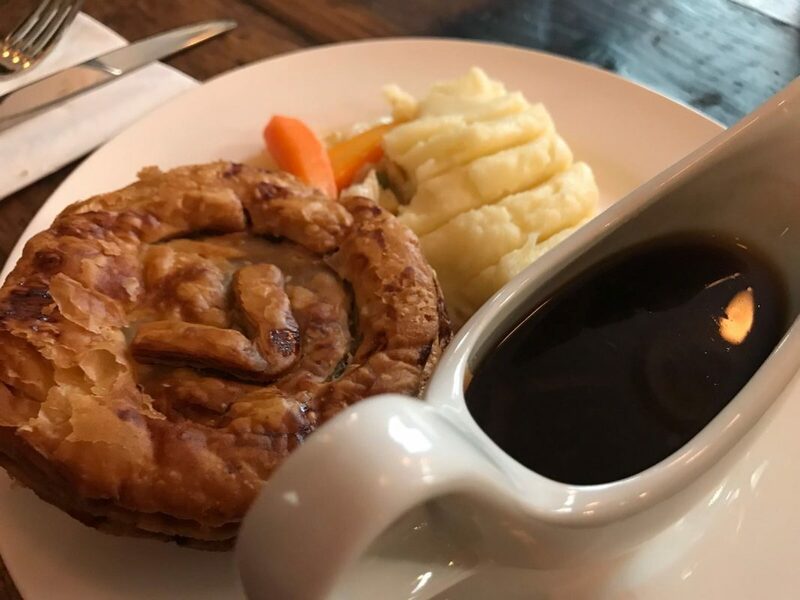 For any stilton lovers, go with the Peppered, Mushroom and Stilton pie as the cheese flavour in the pie is very prominent! It is all thanks to the beer that this gorgeous little pub is open and thriving today. 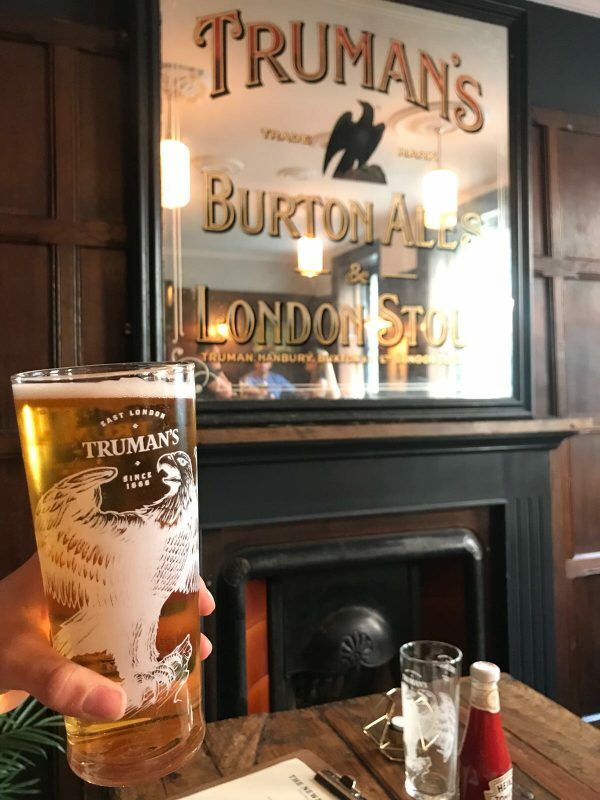 Truman’s Brewery opened the doors of the Newman Arms on 16th May this year and has never looked back! It’s also thanks to managing director James Morgan that the Truman’s Brewery name was revived. This brewery was actually founded back in 1666 and shut up shop in 1989. Thanks to James it re-opened and was available to Londoner’s again in 2010. So two British classics brought together and enjoyed by so many happy Londoner’s makes me very happy. Iin just the 8 years this brewery has been back open, it now has an award winning range of beers. During our visit we tried the Truman Raw Beer, the Bow Bell’s Pale Ale, and the Truman’s Pale Ale. All beers were so refreshing, hoppy, wheaty – all the flavours you expect from a great pint! My favourite had to be the Bow Bells – really citrusy, fruity and hoppy. The awesome bar staff are not just great at pulling pints – we also tried a couple of cocktails. We had the Garden Smash and one that wasn’t on the list, an old favourite of mine – the Tom Collins. 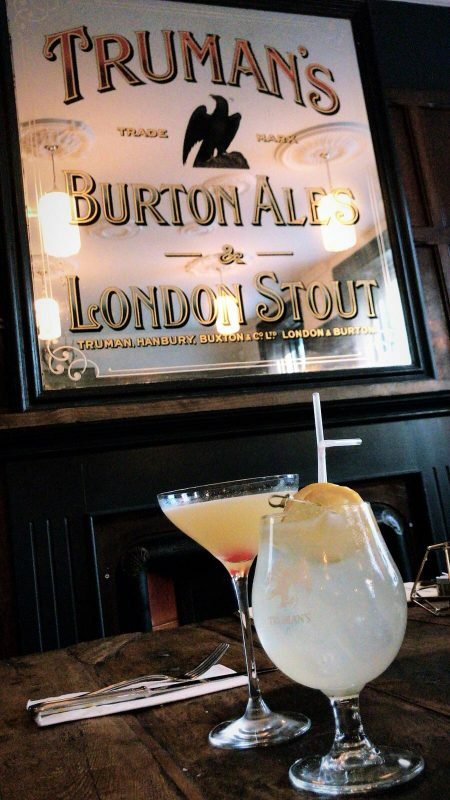 So if you don’t see your favourite cocktail on the menu, they will be happy to make it for you. Probably one of the most exciting parts of my visit to the Newman Arms was that I got to see London’s ONLY Crowler in action. Don’t worry, I didn’t know what one of those was either… It is a machine which fills a 910ml can with any draft beer on site for customers to take away at a price of £8 each. I absolutely love this idea – it means if you find your favourite beer here you can take it home with you! I’ would recommend to drink it within the next 24-48 hours of purchase as the beer goes go flat quite quickly. You can’t beat having some real British classics dating back hundreds of years being revived and brought into the 21st century. What I love about Truman’s Brewery is they have revived old classics and kept that traditional feel, but ensuring they are being innovative and forward thinking. 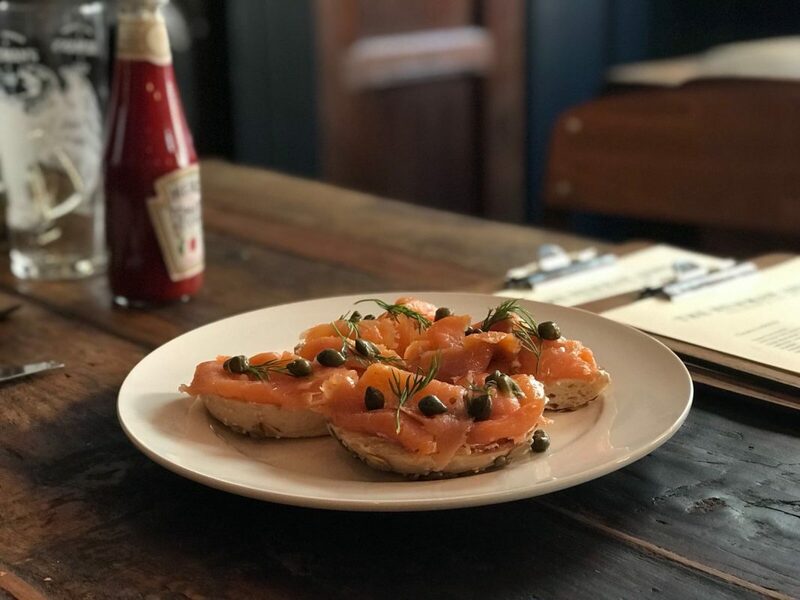 You can find Truman’s not just at the Newman Arms but in Hackney Wick and London City Airport. I am pretty sure they will be popping up all over the place at this rate. Until you find one in your home town, pay a visit to the beautiful Newman Arms – out of your way or not, you’ll soon turn this in your favourite ‘local’.